How can we motivate our children to work harder in school, in a sport or in practicing an instrument? 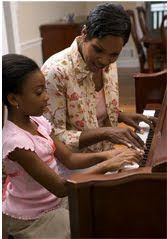 Will the promise of a reward for practicing the piano help our child practice more? Or will the threat of punishment be more effective? When we try to motivate our children to work harder, we can often end up feeling frustrated by the results. Ideas about motivation are changing as new research teases out some of the key elements. According to Daniel Pink’s latest book, Drive: The Surprising Truth About What Motivates Us, trying to motivate children using external rewards and punishment is a mistake. The secret for motivating children to high performance lies in allowing their own internal drives direct their behavior.